The covalent attachment of ubiquitin is a powerful mechanism for controlling protein activity and localization. Ubiquitination is a reversible process conducted by ubiquitin ligases and reversed by deubiquitinating proteases. 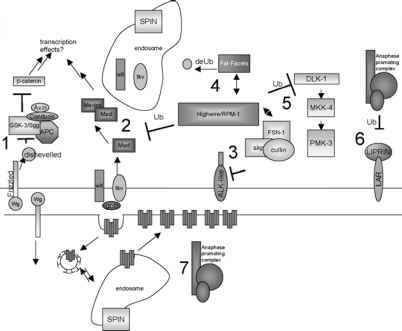 Controlled protein ubiquitination has become a major regulatory theme in synapse development in recent years. Figure 3.2 summarizes many of the known ubiquitination players at the invertebrate NMJ. C. elegans RPM-1 and Drosophila Highwire are large conserved proteins with vertebrate homologs known as Esrom (zebrafish), Phr1 (mouse), and Pam (human) 12,68. The RPM-1/Highwire family has several predicted functional modules, one of which is a RING-H2 finger ubiquitin E3 ligase domain. rpm-1 mutant NMJs display severe reduction of SV numbers per synapse and the presence of several presynaptic densities within one synaptic terminal12,69. NMJs of highwire mutants have greatly expanded bouton numbers and length of branches12,68. The synapse displays normal ultrastructure, but has reduced quantal content. A synaptic quanta is the smallest unit of neurotransmitter release and corresponds to the amount of neurotransmitter molecules contained within a single SV. RPM-1 binds to an F-box domain containing protein, FSN-1, which associates with homologs of Cullin and Skp. This SCF (Skp, Cullin, F-box) ubiquitin ligase complex is required in presynaptic neurons for the restriction and/or maturation of synapses70. Two targets for this SCF complex have recently been identified. One is a p38 Mitogen-Activated Protein Kinase (MAPK) cascade, with the upstream MAPKKK DLK-1/a dual-leucine zipper MAPK as a direct substrate69. Another is an ALK-like receptor tyrosine kinase70. The functional connection between the ALK kinase and the DLK-1 pathway remains to be investigated. Neuronal overexpression of the deubiquitinating protease Fat Facets at the Drosophila NMJ severely disrupts synaptic growth control and thus causes an increase in the number of synaptic boutons71. Mutations in fat facets enhance the NMJ defects in highwire mutants. Together, these results support an evolutionarily conserved function of the RPM-1/Highwire and Fat Facet proteins in modulating ubiquitin to control NMJ development. Figure 3.2. Ubiquitination and Cell Signaling Mechanisms in Invertebrate NMJ Development. (1) The Wnt ligand Wg signaling is required for presynaptic formation of the active zone and for postsynaptic development of the SSR. The Wnt pathway has been well described in early development. Wg may function via Sgg, but the Wg Wnt pathway at the invertebrate NMJ is not well understood. (2) The TGF-beta signaling pathway is important for proper synapse development. Highwire downregulates the TGF-beta signaling pathway and directly binds the transcription factor Medea. Spinster downregulates TGF-beta signaling, possibly by affecting endosomal recycling of BMP receptors. (3) RPM-1 binds the F-box protein, FSN-1, which forms a novel SCF ubiquitin ligase complex. This complex regulates the ALK tyrosine kinase. (4) Highwire binds the deubiquitinating enzyme, Fat Facets. (5) RPM-1 also downregulates the MAPK pathway. (6) The APC downregulates Liprin to control active zone assembly and also (7) regulates neurotransmitter receptors possibly via an endocytic mechanism. The Anaphase Promoting Complex (APC), an E3 ubiquitin ligase that was originally identified through its function in regulating the cell cycle, has recently been shown to control synapse development and function in multiple contexts. In fly NMJs, the APC is localized at synaptic boutons and controls synaptic size by regulating levels of Liprin-a through ubiquitination72. In fly and worm, the APC also regulates the synaptic abundance of postsynaptic receptors72,73. In worm, the regulation of the postsynaptic receptor concentration and abundance possibly occurs via an endocytic mechanism73. Mutations in APC subunits increase the number of glutamate receptor subunits. Mutations that block clathrin-mediated endocytosis block the APC mutation effects, suggesting that the APC regulates glutamate receptor recycling. Proper synapse development requires positional information, which coordinates and maintains the juxtaposition of pre- and postsynaptic elements. Secreted retrograde and anterograde signals aid in this aspect of synapse development. Wnt and TGF-beta signaling pathways, which are best known for providing positional information during morphogenesis, have fundamental roles in synapse development74. Wnts and TGF-betas are secreted by either the pre- or postsynaptic cell and provide crucial signals that regulate the coordinated development of synaptic specializations. The bone morphogenetic proteins (BMPs) are secreted TGF-beta family proteins. Their diverse functions include primary neural induction, dorsal-ventral patterning of the neural tube, axon guidance, as well as synapse development. TGF-beta ligand binding causes heterodimerization of type I and II receptors. The type II receptor then activates the type I receptor by phosphorylation. The type I receptor then phosphorylates R-Smads (Mad proteins in Drosophila and Sma and Daf proteins in C. elegans), which transduce the signal to the nucleus via a co-Smad. The R-Smad/co-Smad complex binds transcription factors to regulate gene expression. Drosophila Wishful Thinking (Wit) is a type II BMP receptor and is required for adequate synaptic growth and synaptic transmission75,76. In wit mutant NMJs, pre- and postsynaptic membranes are detached and the T-bar structure is separated from the presynaptic membrane. This effect appears to involve changes in CAMs, as Fas II is downregulated at the wit mutant NMJ. The Wit ligand, TGF-beta Glass Bottom Boat (Gbb), signals retrogradely from the muscle to affect synaptic growth77. gbb and wit mutants show similar ultrastructural and physiological defects. Similarly, mutants in the type I BMP receptors thick veins (tkv) and saxophone (sax), in the R-Smad mothers against dpp (mad), or the Co-Smad medea all have defective synapses and neurotransmission in embryonic NMJs78,79. Together, these findings demonstrate that an entire TGF-beta pathway is essential for synapse development. The regulation of the Wit TGF-beta pathway appears to involve both the E3 ubiquitin ligase, Highwire, and an endosome pathway79,80. spinster (spin) encodes a protein that may help to regulate this growth factor signaling via an endosomal/lysosomal pathway. It is localized to the late endosome/lysosome compartment in the pre- and postsynaptic terminals80. In the spin null mutant, NMJs overgrow by more than 200% compared to wild type. Genetic evidence in spin mutants shows that the synaptic overgrowth is due, at least in part, to enhanced TGF-beta signaling. Late endosomes have dramatically changed architecture in spin mutants. This disrupted architecture could potentially cause changes in endosomal function and thus misregulation of growth factor signaling. An understanding of TGF-beta pathway regulation in developmental time and space is needed. Wnt signaling molecules are essential regulators of cell fate, cell polarity, cell proliferation, tissue patterning, and synaptogenesis. Many aspects of the Wnt signaling pathway have been defined. Wnts signal through the membrane receptor Frizzled and the co-receptor (Drosophila Arrow). In the absence of Wnt signaling, P-catenin (Drosophila Armadillo/C. elegans HMP-2) is phosphorylated by casein kinase 1 and glycogen synthase kinase 3P (GSK-3P) (Drosophila Shaggy/ C. elegans GSK3P). It is then ubiquitinated and degraded. This process requires the formation of a complex with the scaffolding protein Axin and the tumor suppressor protein Adenomatous Polyposis Coli (APC). Activation of the Wnt pathway leads to phosphorylation of Dishevelled, which prevents P-catenin degradation, which ultimately leads to transcription changes in Wnt responsive genes. The Drosophila Wnt signaling molecule, Wingless (Wg), acts as an anterograde regulator of synaptic growth81. Wg is expressed in motor neurons. It is required for presynaptic formation of the active zone, for postsynaptic development of the SSR, and for localization of Fas II, Dlg, and glutamate receptors. Wg binds Frizzled 2. The Wnt downstream effector, GSK-3/Shaggy (Sgg), is expressed presynaptically in type I boutons at the NMJ82. sgg loss of function causes an increase in synapse number, while sgg overexpression causes a reduction in synapse number. Wg may function via Sgg to regulate synapse development. However, the Wnt signaling pathway is poorly understood at the invertebrate NMJ. The specific molecules in the Wnt pathway, how the pathway is regulated, and the down stream effectors are not yet known. The human APC-|3-catenm complex was shown to bind the human homolog of the Drosophila DLG, suggesting the APC- DLG complex may regulate neuronal function83. Genetic and cell biological studies of Wnts and TGF-betas have revealed a synapse growth and development role for these well-known early development genes. However, the mechanism, regulation, and downstream effectors of the Wnt and TGF-beta pathways, which mediate cross talk between pre- and postsynaptic sites, is not understood. Further analysis of these pathways, their effectors, and the feedback mechanisms that impinge on them will further our understanding of synapse development. Remodeling of the cytoskeleton allows for the control of an amazing diversity of cell shapes and dynamic intracellular behaviors. The NMJ cytoskeleton consists principally of actin and microtubule protein filaments. Polymerized actin (F-actin) is abundantly distributed throughout the synaptic terminal and is concentrated primarily around the active zone and SV clusters. Microtubules primarily run close to, but not within, the synapse. The cytoskeleton plays an important role in NMJ development and maintenance. Figure 3.3 diagrams the major known cytoskeletal regulators at the invertebrate NMJ. A number of experimental observations support the view that dynamic actin filaments are a prerequisite for synapse formation84. First, pharmacological perturbation of actin inhibits synaptogenesis. Second, actin clusters at the presynaptic site before functional synapses form, possibly acting as a spatial marker for synaptogenesis. Third, disruption of signaling pathways involved in actin reorganization results in synaptogenesis defects. The first in vivo evidence that regulation of the actin cytoskeleton can directly affect synaptogenesis in Drosophila comes from the studies of the periactive zone protein, Nervous Wreck. Nervous Wreck contains an N-terminal Fes/CIP4 Homology (FCH) domain and two SH3 domains. The FCH domain is implicated in actin binding. Nervous Wreck activates Wasp, which promotes F-actin assembly in growth cones. Mutations in either nervous wreck or wasp cause an increase in the number of synaptic boutons and branch formation85. Mutant boutons are reduced in size and have fewer active zones, associated with a reduction in synaptic transmission. Figure 3.3. Cytoskeleton Regulators Involved in Invertebrate NMJ Development. (1) Futsch regulates microtubules. dFXR represses translation of Futsch. Wg localizes Futsch. aPKC promotes the association of Futsch with microtubules. (2) Dynactin regulates the Dynein microtubule motor. (3) Synapsins tether vesicles to actin. (4) Fas II localizes the RacGEF Still Life90. Still Life regulates actin dynamics via Rac. (5) Nervous Wreck activates Wasp, which promotes F-actin assembly. (6) Spectrin heterotetramers interact with short actin filaments and stabilize NMJ cell adhesion molecules. Actin clusters SVs within a presynaptic vesicle pool. Inducing actin depolymerization with cytochalasin-D at the Drosophila NMJ causes activity-dependent depletion of SVs86. This study corroborates a model in which actin plays a facilitatory role in SV endocytosis and mobilization from SV pools. Synapsins are a family of actin-associated phosphoproteins that are required for maintaining the SV reserve pool84. They act by tethering the SVs to the actin cytoskeleton. Synapsins are present in fly (Syn) and worm (SNN-1), but their functions are not yet reported. Spectrins are actin-bundling proteins essential for embryonic development and important for synapse stabilization at the adult NMJ. P-Spectrin and a-Spectrin form heterotetramers that interact with an actin network localized to the plasma membrane. The genomes of C. elegans and Drosophila have a single gene for each subunit. In Drosophila, depletion of presynaptic spectrins, using transgenic RNAi, revealed a role of spectrin in synapse stability21. The mutant NMJs show altered axonal transport and disrupted synaptic microtubules, reminiscent of synapse retraction. Loss of presynaptic Spectrin causes a disorganization and elimination of synaptic CAMs, Fas II, and Neuroglian. Spectrin may thus have a role in linking synaptic cell adhesion with the stabilization of the cytoskeleton. (FMRP) is an RNA-binding protein that regulates translation. The Drosophila FMRP homolog, Fragile X-related protein (dFXR), represses translation of Futsch89. Thus, dFXR controls the microtubule cytoskeleton to maintain both synaptic strength and function. The Wnt family protein, Wg, localizes Futsch. wg mutants have an increase in the number of boutons that show splayed microtubules81. The opposite occurs in sgg mutants in which looped boutons are in excess82. In addition to the microtubules themselves, regulation of the microtubule motor, Dynein, affects NMJ development. 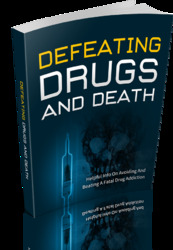 Dynactin is a multiprotein complex thought to mediate Dynein function in the cell. 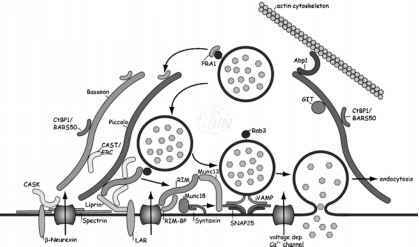 The cytoskeletal Dynactin protein complex, including Centractin and Glued, is necessary for synapse stabilization20. Synaptic proteins were originally thought to be synthesized in the cell body and then trafficked to the synapse. However, local protein translation is an elegant way to obtain fast and efficient synapse specific localization of new proteins. There is increasing evidence that local protein translation modifies active synapses and thus affects synaptic plasticity. Localized translation is important for the efficacy and morphology of the Drosophila NMJ. Glutamate receptors are locally translated in the postsynaptic muscle. Mutation of translation factors, including eIF4E and poly(A)-binding protein, alters the abundance of receptors in the postsynaptic membrane91. Large aggregates of translational components as well as messenger RNA of the postsynaptic glutamate receptor subunit DGluR-IIA are localized to the larval NMJ. Genetic manipulations using the translation initiation factors eIF4E and poly(A)-binding protein cause an increase in synaptic translation aggregates. This aggregation is associated with a significant increase in postsynaptic DGluR-IIA and a reduction in the cell-adhesion molecule Fas II. In addition, the NMJ size and neurotransmission efficacy is significantly increased. Pumilio (Pum) negatively regulates expression of the translation factor eIF-4E at the NMJ92. It is localized to the postsynaptic side of the NMJ in third instar larvae and is also expressed in larval neurons. GluRIIa is upregulated in pum mutants. Neuronal Pum also regulates synaptic growth. Pum (lf) mutant NMJ boutons are larger and fewer in number, while Pum overexpression increases bouton number and decreases bouton size. Unlike postsynaptic sites, presynaptic terminals appear to lack ribosomes and translation machinery. It is thus surprising that several RNA-binding proteins appear to be present in axons and presynaptic terminals at the Drosophila NMJ. The precise function of these RNA-binding proteins awaits future studies.